Two screen video done in collaboration with Arts and CERN and FACT Liverpool. Script by Bauer includes texts from Carlo Rovelli, Suhail Malik and Nikolai Federov. The human phenomenology of time is no longer adequate to how we organize, inflect and orient the systems we have created. As the research at CERN demonstrates, these advanced systems function on scales beyond the experiential capacity of the human. Our physiology confines us to a particular temporal ‘arrow’ of experience, yet science enables us to ‘know’ reality beyond this experience. Scalar Oscillations makes a distinction between time as it functions in science and temporality, the daily experience of time’s apparent flow from imminent future to receding past. The difference between the two provides an example of a fundamental discrepancy that exists between realities of the material world, and how that world appears to us. The installation proposes that this temporal flow is more a result of our physiology rather than something inherent to time itself, asking how much our experience of temporality correlates with material conditions outside of such experience. If we evolved only to survive in reality rather than understand it, as an evolutionary logic proposes, then to comprehend time we need to become something else, something beyond the bounds of the human as we currently define it. Reality is perhaps stranger than we have the capacity to imagine. Collaborative three screen video by Laboria Cuboniks (video-Diann Bauer, Sound-Katrina Burch with vocals performed by Joy Mariama Smith, Script compiled by Patricia Reed). Originally produced for The Future of Demonstration, season 1: VERMÖGEN, 2017, Vienna, reworked for the Post-Cyber Feminist International at the ICA London organized by Helen Hester and Rosalie Doubal. This video was done independently about the collaborative project of Xenofeminism. This is the three main screens for a 7 channel video installation done with A.S.T. (Diann Bauer, Felice Grodin, Patricia M. Hernandez and Elite Kedan) Texts written by Diann Bauer (central screen) and Keller Easterling (side screens). Sound by musician Jake Meginsky. With-in the installation there are 4 additional screens (not pictured here) with animations by artist Keith Tilford, planetary scientist Dr. Pasquale Tricarico, and engineer Andrew Wong. Also included is the website astronaut.io also designed by Wong with James Thompson. Editing work was done by Levin Haegele and translation work was done in part by Amani Althuwaini. Production assistance was provided by Ayman Zedani. The project was produced with the support of Christine Tohme and the Sharjah Art Foundation. 2017. The projections, for the purpose of clarity, are designated ML(left), MC(centre) and MR(right), the three main projections, and the monitors are A,B,C and D. The video begins with a 3 minuet didactic demonstration of Claude Shannon’s diagram explaining the operation of communication and noise, the remaining 14 minutes of the ML and MR videos comes from the writing of architect Keller Easterling. Drawing from her recent lectures, the text in ML and MR addresses infrastructure and power, broadly describes the conditions in which we are swimming and suggests possibilities for political agency within those conditions. The text for MC, the central screen, written by Bauer, with bits taken from Orwell, broadly expresses the vertigo induced by the conditions described in the side panels. VIDEO A uses a website called astronaut.io as its base. We added the graphics and text. The videos in the central oval come from YouTube are algorithmically chosen.The footage of the earth is taken from the ISS. VIDEO B takes text from Easterling with graphics and visual glitches, at times random, at times completing the triangle painted on the wall itself. 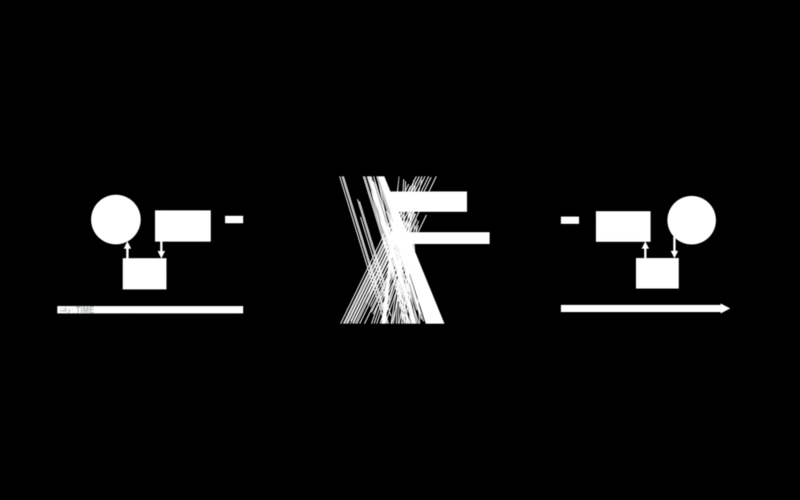 VIDEO C is a gif designed by artist Keith Tilford, an infinite flow of servers. VIDEO D used text from promotional videos for financial services and text written by Diann Bauer. The image is an animation by planetary scientist Pasquale Tricarico. This was make for inclusion in a 7 screen video installation called Noise (back broadcast through the persistent illusion) for the Sharjah Biennale 13 curated by Christine Tohme. The animation for this video is taken from planetary scientist Dr Pasquale Tricarico. It is of Asteroid 2011 MD that passed by the earth on June 27, 2011, passing in-between the earth and our constellation of GPS satellites. The animation is from the perspective of the asteroid. The text is a combination of work written specifically for the piece by Bauer and a promotional video for a financial services company. Looping video originally done for the Bard Centre for Curatorial Studies journal aCCsSions in 2016. It plays on political scientist Jodi Dean's quote “Goldman Sachs doesn't care if you raise chickens”. Video Diann Bauer. Video made for the launch of the #accelerate reader, published by Urbanomic, 2014. Text included in the video is compiles from the reader and includes Srnicek/Williams, Brassier, Land in addition to part of the script from Blade Runner and original material by the artist. This video was part of a collaborative research and development project undertaken by Real Flow (Diann Bauer, Victoria Ivanova, Christopher Kulendren Thomas and Suhail Malik) for the reorientation of art and finance.